Gareth Maybin was happy to settle for a share of second place and the biggest payday of his career as Australia’s Marcus Fraser won the Ballantine’s Championship by four strokes. The Ballyclare man was tied for the lead with Fraser after storming to the turn in a sensational 33 shots. But he limped home in 39 for a 72 that left him tied for second with Fraser’s compatriot Brett Rumford on eight under par. His consolation was a cheque for over €191,000 - the biggest of his career. “It’s been pretty good,” Maybin said after his third top 10 of the season and his best finish since he finished second in the South African Open at the end of 2008. Fraser, 31, ended a seven-year winless streak with a final-round three-under-par 69 securing a wire-to-wire win in the weather-affected 54 hole event. Fraser said: “It’s unbelievable. I have had a lot of chances over the last six or seven years to win and I haven’t taken them and a lot of doubt creeps into your mind and you start to question whether you should be going it. “Probably three or four years ago I thought about giving it away just because I was playing terrible. Leading by a shot after 36 holes, Fraser made crucial par saves on back-to-back holes at Pinx GC before the turn to share the halfway lead with Maybin. But as Maybin faded down the stretch, Fraser maintained his composure to record an impressive victory. Graeme McDowell shared 18th place on one under after a closing 71 with Shane Lowry’s 75 relegating him to tied 40th on one over. Peter Lawrie ended on four over after a 77. Irish Open champion Shane Lowry headed to Scotland with a spring in his step after earning his first cheque as a professional in the French Open. But there was also smiles from Ulsterman Gareth Maybin who tied for 10th to grab a last gasp place in this week's Barclays Scottish Open. Show me the money. First cheque for Lowry.Germany's Martin Kaymer beat Lee Westwood with a hard fought par at the first extra hole to take the title and move into the world's top 20. But it was also a good week for Lowry, who finally opened his European Tour account with a cheque for €16,800. Shane LowryShane Lowry continued his magnificent start to the 2010 season when he opened with a one under par 71 in the Commercialbank Qatar Masters. The reigning Irish Open champion, who moved up to 90th in the world thanks to his fourth place finish in last week’s Abu Dhabi Championship, birdied the par five 18th in testing conditions to finish the day tied for 15th place with Ulsterman Gareth Maybin. Rory McIlroy had plenty of problems with sand in the second round of the Abu Dhabi HSBC Golf Championship. 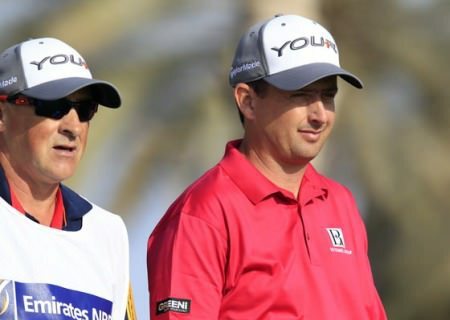 Picture Stuart Adams www.golftourimages.comGareth Maybin is a stroke off the lead in the $2.5m Abu Dhabi HSBC Golf Championship - just seven weeks after struggling to keep his card in his last tournament appearance. But his bogey-free 36 holes was still overshadowed by a two-stroke penalty for Rory McIlroy and positive performances for Padraig Harrington, Graeme McDowell and former world No 1 Tiger Woods.